Rebound Congestion: Treatment Is Complicated by the Disruption of Airflow. When used as directed, topical decongestant nasal sprays are safe and effective medications for the relief of short term nasal congestion. Due to the fact that upper respiratory infections can often last longer than the 3-4 day “safe period” the prolonged use of the sprays can induce rebound congestion which persists long after patients have recovered from the underlying illness. Rebound congestion first appeared in medical literature in the 1930’s. Prior to the mid-1960’s, decongestant nasal sprays required a prescription. When these medications became available over the counter, rebound congestion began to proliferate. The medical term for rebound congestion is Rhinitis Medicamentosa (RM) which means congestion (Rhinitis) cause by medication. While the pathophysiology of RM is a subject of debate in published medical literature, the cornerstone of treatment is always the same. Patients must discontinue their use of the sprays. 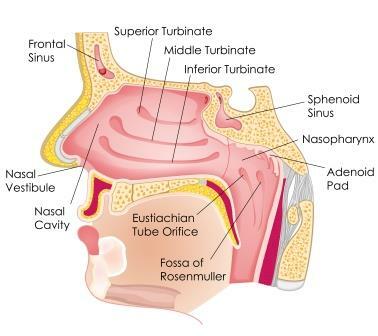 Rebound Congestion occurs then the 3 turbinates (superior, middle and inferior) are abnormally enlarged and block the nasal airflow into the nasopharynx. When the sprays are withdrawn, patients endure a period of extreme discomfort that often lasts 4-7 days. Very few individuals are able to tolerate this, which is why the treatment of RM patients often fails. Although intranasal and systemic steroids effectively relieve inflammation, there is no improvement in airflow as measured via Rhinomanometry. From the patient’s perspective, the ideal treatment would be one that preserves their airflow as the decongestants are withdrawn. This is the basis of the Rhinostat System. In addition to providing patients with an apparatus to precisely control dosage strength, Rhinostat kits are free of the preservative benzylkonium chloride, which has been shown to exacerbate RM. 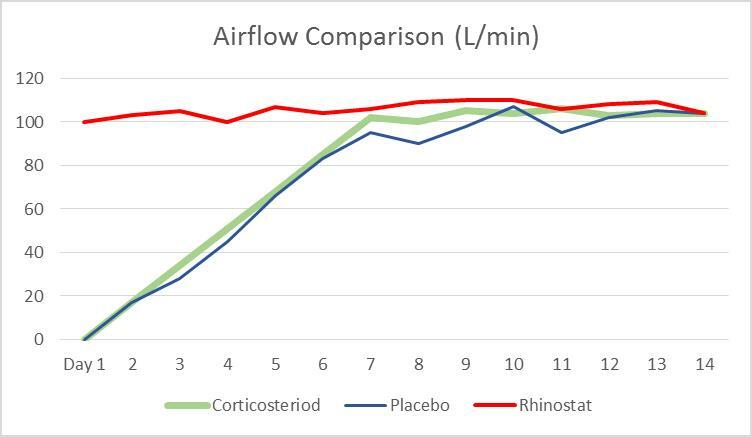 The following chart depicts the comparative airflow for patients treated with steroids vs. Rhinostat.